The first time I took I bite out of these babies I thought, “There is a nut explosion in my mouth!” If you’re like me and inserted a dirty joke or thought here we can be BFFs. One morning for breakfast I really wanted a muffin. Specifically, a banana nut muffin. More specifically, one right out of the oven and with a nut in every bite. I was trying to think of any place nearby that would have exactly what I was looking for and nothing came to mind. The closest thing was Dunkin’ Donuts and I don’t even know if they make banana nut muffins anymore. I thought about just getting in the car and seeing what they had but I didn’t trust myself to go there and not leave with some hash browns. At this point the only way to get exactly what I was hankering for was to make it myself. And I needed to make it quick before I reached Mach 5 on the hunger scale. I printed this recipe out a while ago but never made it, even though it had been hanging around my kitchen for a few weeks. When I realized I had all the ingredients and it can be put together quickly in my blender I got all excited thinking that my banana nut muffin dreams were closer than I thought. And I became even happier when they came out of the oven looking pretty and smelling so good. The instructions said to let cool after taking them out of the oven and it was the longest wait of my life. When I took my first bite it was worth the wait and exactly what I was looking for that morning. Aside from tasting delicious I like these muffins because there isn’t any sugar in them. They’re actually Paleo, which makes me feel less guilty about having a muffin in the first place. Plus with doing CrossFit I don’t feel like I’m throwing away my workouts. And I need all the help I can get to get my 6-pack in gear. So far I have a 2 – maybe a 2-and-a-half-pack. I have a ways to go. I hadn’t even really heard of the Paleo diet until I started CrossFit three years ago. I don’t follow it strictly, but I like the eating whole, non-processed food part of it and that’s what I’ve tried to maintain. Like I said, I’m not 100% Paleo – or anything – and it’s because I don’t want to be defined by one diet. I love all kinds of food too much to be. A few years ago I played around with being vegetarian and even vegan. Though I liked the things I ate and made it didn’t feel natural to me. And as a Filipino-American I felt like I was betraying my heritage and country. Seriously, a life without longanesia, lechon, cheeseburgers, and hot dogs every once in a while is a life I don’t want to lead. I think if you’re vegetarian, vegan, Paleo, whatever that’s great. If that makes you happy that’s really cool. I’ve always believed that diet and life are not one size fits all. If you’re happy, I’m happy, our bellies are happy, and we’re not being douches then the world is a better place. The recipe calls for a few drops of Stevia, which I didn’t have, so I used 8 pitted dates instead of 3. Also, I only had half the amount of coconut oil, which bummed me out. To make up for the remaining amount of coconut oil I used melted butter. I think it actually made the muffins taste better. The recipe doesn’t make a full dozen. I’ve made them twice and got 9 muffins. Well, it was more like 8 good ones and one runt. But the runt is good for the “I just need to taste one and make sure they’re OK” taste test. Plus it’s a runt – and it is adorable! And let’s not forget the nuts. There is a nut in just about every bite and that makes a girl like me very happy. 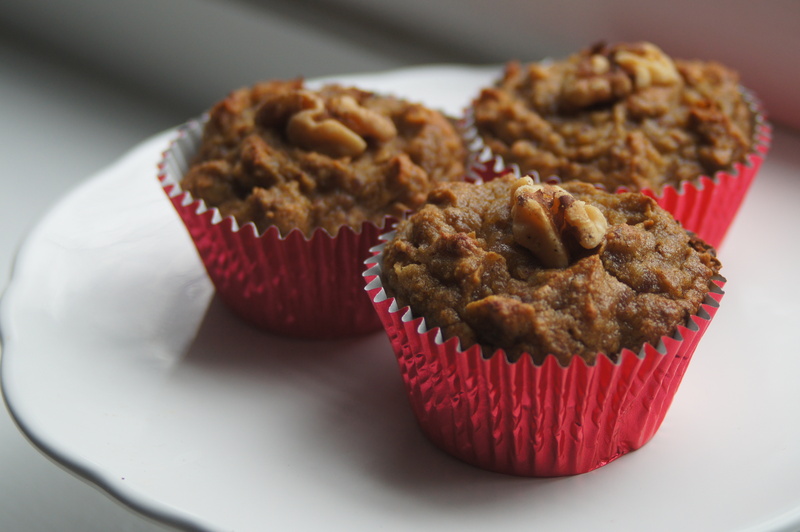 Bananas and nuts – one of the best combinations ever. Don’t even resist the urge to have a naughty thought. Just let it happen.